A newly formed coalition wants the Metra Electric rail line to be reinvented to better serve the low-income communities it runs through, connecting riders to jobs and spurring economic development. Roseland is one of those communities, and it is ripe for transit-oriented development, says Andrea Reed, executive director of the Greater Roseland Chamber of Commerce. The area is dotted with vacant lots, many of them situated near the Metra Electric (ME) line. “We have a lot of vacancies. But to me, that also means a lot of opportunities,” said Reed, whose organization is part of the new Coalition for a Modern Metra Electric (CMME). For Reed, those opportunities are boutiques and coffee shops that will employ residents and cater to tourists visiting the Pullman National Monument Park. President Barack Obama designated portions of the Pullman community—created by its namesake founder, railroad baron George M. Pullman—as a national park in 2015. 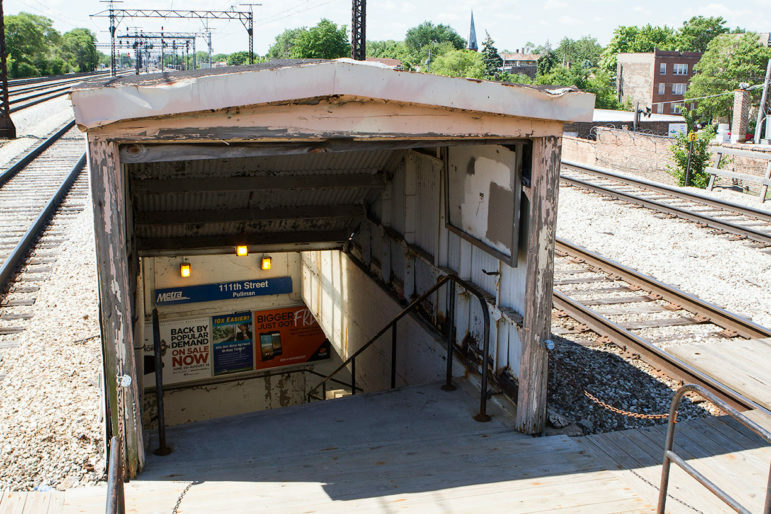 Metra is now planning $4.6 million in station improvements along the ME line, including at the 111th Street Station and the 115th Street-Kensington station, both in Pullman. The ad-hoc coalition wants Metra, the commuter rail agency, to study the cost of operating the line with more frequent trains and better fare integration with CTA and Pace buses. As Metra’s fare system is now set up, lower-income bus riders are priced out, the group says. Ultimately, however, the coalition envisions the ME line serving as a high speed rail line from downtown Chicago to O’Hare International Airport. Former Mayor Richard M. Daley first raised the idea of high speed rail service to O’Hare in 2010, and Mayor Rahm Emanuel has revisited that idea. “To do a full financial analysis will take a lot of dollars and a lot of time. We have to talk to our board and look at what direction we need to go in,” Metra’s director and CEO Don Orseno said when the coalition presented its proposal at last month’s board meeting. The idea of having the ME line operate like a rapid transit line is not new. It has been floated as part of previous proposals, including the plan to have ME trains operate for Chicago Transit Authority passengers as a Gray Line. But the new coalition’s efforts mark the first time that a concerted push has been launched to move the idea from the “needs more study” shelf into an actionable plan. In fact, the CMME wants the ME line to operate like the CTA’s L system, running every 10-15 minutes. That’s similar to how it operated more than 30 years ago: Until 1981, trains ran every 20 to 30 minutes. At that time, Illinois Central (IC) operated the line, which Metra took over in 1987. “That is what the Metra Electric line was built for,” said Dan Johnson, a lobbyist with the Midwest High Speed Rail Association, also a coalition member. His group has been pushing for high speed rail service to O’Hare and is dovetailing its efforts with the coalition. The “bones” or infrastructure of the ME make it ideal to operate as a rapid transit system, Johnson added. Its main line is the only Metra track that is above-ground for its entire length and doesn’t share tracks with freight trains, unlike Metra’s Burlington Northern Santa Fe and Union Pacific lines. Those lines are owned by freight companies, which affects Metra’s timetables, Johnson says. The ME has two at-ground branches: South Chicago and the Blue Island. The tracks were elevated because of the 1893 World’s Fair to eliminate unsafe rail crossings for fairgoers. To ferry patrons to the fair, the IC built tracks to run express trains. Metra is planning to improve the 111th St. Station near Pullman National Monument. The Metra Electric runs like a vein through mostly Black communities on the city’s South Side and south suburban communities and could serve as an economic engine for these areas, which have long suffered from disinvestment. When businesses, jobs and residents left the communities, it bolstered the arguments for service cuts due to declining ridership, Johnson noted. Under Metra’s domain, ME ridership peaked at 12 million in 1990, but it has declined steadily since then. In 2015, annual ridership was 7.9 million for the main line. For its two branches — the South Chicago and Blue Island — ridership that year was more than 868,000 and 284,000 respectively. Metra covered an operating deficit of $64 million in 2015, when the line generate $46 million in revenue but cost $110 million to operate. Even so, Johnson called the line an asset that, with more frequent trains, would attract new businesses and improve transit access to jobs, especially in the growing suburban employment market. That market is low-income bus riders. Metra, Johnson said, doesn’t allow transfers from CTA or Pace — which forces bus riders to pay a second fare to transfer to a Metra train. That “brick wall,” as Johnson calls it, penalize bus riders, especially low-wage workers. Metra, he said, should allow a transfer discount, similar to the discount offered by CTA for bus and rail riders using the Ventra card. Charging people two full fares limits who can ride Metra, Johnson noted. The CMME has been talking to community groups along the ME line to get their support and urge them to join the coalition. The group already has about a dozen members, including the Active Transportation Alliance and the Center for Neighborhood Technology. It hopes to meet with elected South Side and south suburban officials to push its plan. “Metra doesn’t really want to do anything [other] than what it already does. So it is going to take an enormous amount of public pressure and political will ­­­­­to get them to move,” said Linda Thisted, of the Hyde Park-based group Coalition for Equitable Community Development. State Rep. Al Riley (38), who was a member of the now-defunct House mass transit committee, says the idea has merit, along with many others aimed at sparking more economic development in disadvantaged communities. Many south suburban towns in Riley’s district are served by the ME. Johnson understands that getting everyone on board won’t happen overnight. “Government is slow, but we will get there,” he said. South of Kensington to University Park would remain a Metra Suburban train operation, utilizing the aforementioned tap-in tap-out distance based Fare collection system. These extremely cheap and easy to implement changes the existing Metra Electric could transform it into a Potent Dynamo, to create Thousands of New (and Permanent) Jobs, and BILLIONS in New Economic Development in the depressed South Side minority communities where it most needed! and killings as seen daily in Chicago’s media, and Worldwide ….. The Crain’s article above clearly shows us those neighborhoods, so what can our Mayor do about it? Neighborhoods around Souuth Side Electric District stations have residential and commercial vestiges of their former economic vitality that could be restored with the Gray Line. Repair and rehabilitation would be cheaper than wholesale redevelopment and TIFs, preserve what little value properties have for their owners, and even recover some of the lost value. IMO, this contributes to property tax revenues with a quicker payback. The Ventra card doesn’t accommodate entering riders continuing to suburban stations without some form of visually inspected proof of payment, whether transfering from a Gray Line train or boarding Metra at a common (express) station. Metra’s smartphone app might work at turnstiles. One alternative would be to dispense a dated, time of day, zone proof of payment by Ventra to be displayed on board. Entering data would processed for the approriate transfer or initial fare and stored for subsequent transfers. A Ventra card also could be issued with cash or bank card fare payment so no cash fare is handeled on board. A fare inspector (conductor) would be a trade-off for attended stations with a purchase of service from Metra. Mike is on point and has been promoting this to anyone who will listen for many years. Residents of the surrounding communities must wake up and demand the services our tax dollars rightly pay for. Services that are freely given to communities of privilege. Transit Oriented Development is the new buzz among transportation planners. We have the transit we must make them develop it. Planners have been trying to shut down portions of the Metra Electric for years but they wanted wait for a costly and protracted red line extension to provide rapid transit access into the CTA for Roseland, Morgan Park, Pullman and west Pullman. Mike has shown us it could be done in one year with what is already built. I also note that Amtrak runs on two outer non-electrified tracks of that 10-track-wide elevated right-of-way. One of the things I had said,and written, for years was for Amtrak to add a stop at the Museum of Science and Industry for the state-of-illinois funded trains to champaign/carbondale, the “Illini” and “Saluki”. This will provide more train riders to the museum and mid-south side,, tourism, without the transfer at Homewood way out on the metra electric suburbs. It would also give the neighbourhood and MSI 2 trains direct to union station to connect to/from other amtrak and metra routes….bcs one of the obstacles of Illinois/Wisconsin tourism to MSI is that the Metra Electric stations in the Loop are way out by the lakefront at Randolph or Van Buren, and not connected. But Amtrak uses the same route from Kankakee and Homewood stations, and runs non-stop on the right of way, then slips out under the mccormick place to the st charles air line rail embankment to connect over to union station tracks to back in – and be connected to the rest of the national rail system. Also will give Univ of Chicago students better access to use amtrak to their home towns throughout east-central and southern illinois. and then CTA buses and UC shuttles meeeting there as well for easy connections – and special Cta bus runs for Sox game days. And passengers can walk to the Museum, to Jackson Park. All these trains already run on these tracks, there is nothing to add for trains. Add some extra platforms for the amtrak so that they stay on their own tracks and dont have to crossover…..
and use all same existing equipment. even as “CTA” trains for gray line and gold line, they can use the metra style cars….it’s the fare media and the ventra turnstiles that will matter. while the local in-city stops can have 10-15 mins service by gray or gold trains. And passengers that need to transfer, can do a large part of it there, bcs they do not connect in the loop. But DO connect out at MSI as all the trains for these 3 companies already run on it there. A Museum of Science & Industry station for Amtrak and a CrossRail regional express service at 57th Street also would serve the University of Chicago Hospital, a much larger travel generator than the University, albeit still significant for speakers and conferences. More doable than a regional electrified CrossRail express would be extending and expanding Metra’s North Central Service through Union Station over a new direct connection to the CN. This would allow express service between 57th Street, McCormick Place, and Union Station to O’Hare Transfer and continuing as a local service to Antioch. Metra’s three man tracks from Union Station are near capacity and can’t support separate airport express trains; so a combined service is the practical solution. A fourth main track would be costly; and limited capacity at Union Station may preclude more frequent or separate airport trains without major investment in the billions. CTA Blue Line service would be very competitive for time and cost and only attracts about 2,600 daily boardings, so boardings at Union Station for O’Hare would be small, proportional to current ridership, but increased by expanded hours of service and half-hour frequencies, about 80 trains a day. Convenience for Electric District riders, McCormick Place trade shows, and the MSI and U/C should add modest ridership from the south. Further ridership would be attracted for north suburban employment. The market hardly justifies the cost of a direct underground connection to international and domestic terminal stations and separate airport trains. Improved Gray Line service would add to extended NCS ridership to 57th Street.